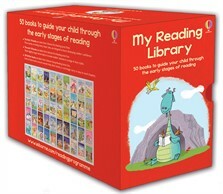 A brilliant boxset of 50 paperback books to help your child towards independent reading. The first 14 books are taken from Usborne First Reading Level Three. These stories, including many classic tales, are designed to boost developing readers’ confidence. The next 16 books are taken from Usborne First Reading Level Four. These slightly longer stories help increase readers’ stamina in a range of story styles. See Extras to view all titles in this box set.